Clean tomatoes and carefully cut off the tops. Scoop out pulp (very easy with a teaspoon, just be careful not to break the bottom of the tomato). Chop pulp finely and leave aside. Take out crumb from bread and dice it. Heat 2 tablespoons of olive oil in a pan; brown crumb dices and chopped garlic. Preheat oven to 400° F (200° C - Th 7). Dice feta cheese. Combine it with fresh cream, salt and pepper. Add thyme, capers and crumb dices. 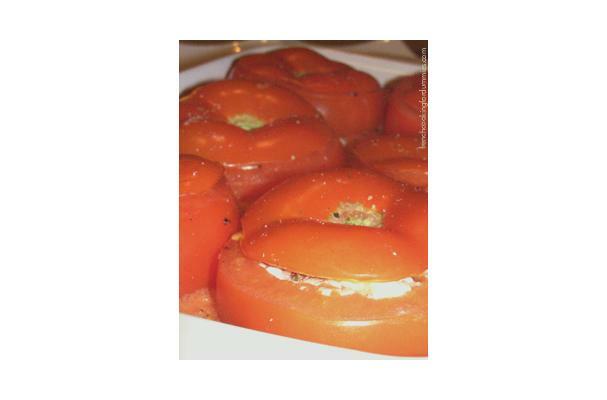 Put tomatoes in an oiled baking dish. Fill with mixture. Put tops back on tomatoes. Pour chopped pulp between tomatoes (not everything if you have a lot). Add salt & pepper and 3 tablespoons of olive oil on top. Bake in oven for 15 to 20 minutes. Serve with a salad or rice.